Last night, Oklahoma was scheduled to execute two individuals. The second execution was to be of a man who raped and murdered an 11-month-old girl. That execution never took place because the first execution—that of a man who was involved in the murder and burial alive of a 19-year-old woman who walked in on a robbery—ran into some difficulties. The state was using a new lethal injection cocktail and, it seems, the poor murderer suffered a bit before expiring of a heart attack. I want to highlight two reactions to this "botched" execution. The first was an absurd bit of moral lunacy, the second a more nuanced and interesting question. The moral lunacy first: Anti-death-penalty advocates seized on this instance to post charts such as this one that purport to show the United States is just as bad as China and Iran because we execute criminals and they execute criminals and all executions are obviously the same. The suggestion that the United States taking decades to execute first degree murderers and Iran hanging gays from cranes and China murdering political dissidents is in any way similar is an idiotic bit of false moral equivalence, one that proves the deep unseriousness of a certain segment of the anti-death penalty contingent. The second reaction—revulsion that the state would engage in "cruel and unusual" punishment by having the subject of an execution suffer before he expires—is a bit more reasonable and something that we should address. It is, of course, worth noting that Oklahoma in all likelihood did not intend for this poor murderer to suffer a bit before he died. As such, the constitutional worries seem moot. And, frankly, as someone who believes that the death penalty serves as retribution rather than deterrence,* I have a hard time getting upset when someone as disgusting as the condemned suffers a bit before expiring. But as a general matter and a basic principle, I don't think the government should be in the business of intending to make people suffer horrifically before they die. So how do we minimize suffering of the condemned? Our biggest problem as a society is that we have decided bloodlessness is a suitable stand-in for lack of suffering (and a way to protect the sensibilities of those who support the death penalty). Well, the pursuit of a bloodless execution seems to have backfired pretty badly here. And there's evidence that previous lethal injection cocktails weren't much better. Allow me to propose a rather radical alternative: the guillotine. There are other, less dramatic, ways, of course. Hanging and firing squads would probably be quicker and more painless than lethal injection or the electric chair. But the guillotine really seems to solve everyone's problems: It was designed to deliver an efficient, quick, and painless death. It performs that task admirably. I understand the irony of a reactionary such as myself embracing the Terror's preferred method of execution, but one must give credit where it's due. If we're going to do something—and a large number of Americans and American states are pretty committed to performing executions—we ought to do it right. And "right" in this case means a quick and painless death. 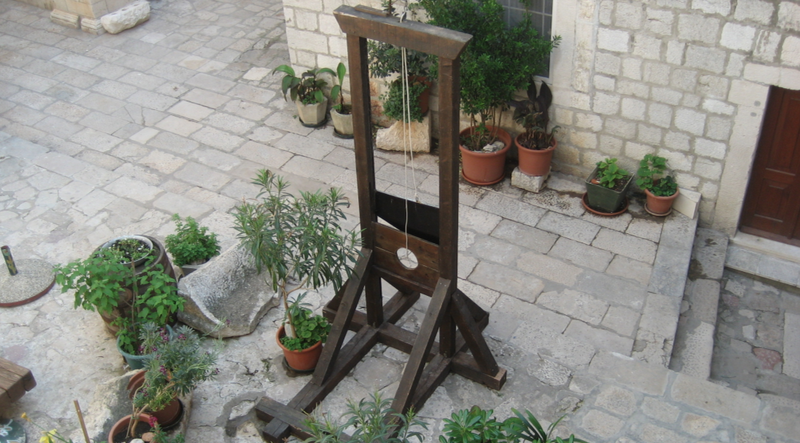 I can't really imagine any reasonable objections to a widespread adoption of the guillotine. *For what it's worth: I believe the studies that show the death penalty does nothing to deter crime yet support it anyway, as I believe there are some crimes so heinous that there can be no forgiveness from society. This plays into my whole theory of the judicial system, which is that we should imprison fewer nonviolent offenders, rehabilitate those prisoners who can be rehabilitated, and severely punish the rest. I also think we should probably execute fewer people and heighten the standards of evidence required before an execution can be obtained, but that's a post for another day.